Born in Swansea, South Wales. Graduated from Leeds College of Music where he also taught for a number of years. His most recent cd is called Ripples. A trio recording, it is his third under his own name. A previous cd Once More For Luck recorded in 2010 also features him a trio setting again with bass and drums. His second album, And Then Some, also from 2010, was partly funded by Jazz Yorkshire. This again features his writing and arranging , but this time in the context of a septet for trumpet, saxophone, trombone, guitar, piano, bass and drums. His work in this area was recognised when he was shortlisted for an award as composer/arranger of the year in the Jazz Yorkshire Awards 2012. The cd was recently featured on the UK and Europe Jazz Showcase on ukjazzradio.com. As well as leading his own groups, he frequently guests as a soloist with bands up and down the country. He is also to be heard as part of the Ronnie Bottomley Jazz Orchestra, the Yorkshire Jazz Orchestra directed by Tony Faulkner and the Al Wood Trio. His guitar playing has been featured frequently on radio and television - The Quest (Yorkshire TV), Peak Practice (Carlton TV), This Is My Moment (Granada TV), I Feel Fine (Granada TV), Pebble Mill (BBC TV) , Grange Hill (BBC TV), Big Ships (Black Box Productions), The 'L' Shaped Room (Radio 4), Night Ride (Radio 4), Tony Faulkner Jazz Orchestra (Radio 2 ), and the Geoff Laycock Big Band (Radio 2). 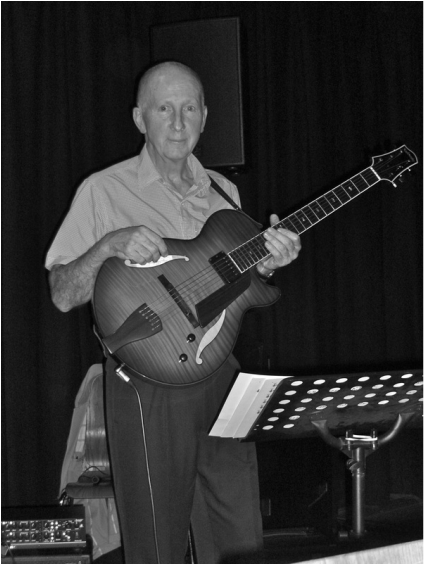 His long and varied career as a freelance guitarist has seen him working in West End and touring productions of shows such as Chicago, Bat Boy the Musical, Fame, Dirty Dancing, Spamalot, Jerry Springer the Opera, Our House, Bad Girls, Follies, Smokey Joe's Cafe, The Rocky Horror Show, Blood Brothers, Fiddler On The Roof, Honk, Copocabana, Grease, Chorus Line, Barnum, 42nd Street, Showboat, Les Miserables, Cats, Little Shop of Horrors, Chess and West Side Story, and as accompanist to artists as diverse as Jack Jones, Mel B, Lee Gibson, Claire Martin, Russ Abbott, Gene Pitney, Dave Willetts, Marti Caine, and opera star Lesley Garrett. He works regularly with orchestras such as the Royal Northern Sinfonia, The Halle Orchestra, and The Royal Liverpool Philharmonic Orchestra. He can also be heard on the cast albums of Honk (Dress CD004), Dave Willetts in Concert (UK Productions) and Bat Boy the Musical (Halo 161203). His guitar playing was also recently featured on the soundtrack to the recent West Yorkshire Playhouse production of 'Tis Pity She's a Whore."